One of my favorite pairings, florals and amber. The Girl is, well, feminine. But I don’t like assigning seasons, genders, or occupations to certain scents. I will say that this is a lovely, pure amber fragrance that doesn’t try to muddy the waters by adding in too many florals. 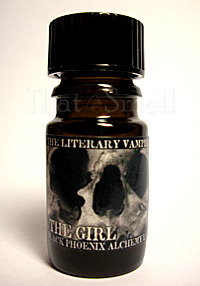 The Girl is a limited edition fragrance from Black Phoenix Alchemy Lab’s 2009 Halloween limited edition run. In Bottle: Light jasmine and ylang-ylang. Smooth fragrance with a nice sweet amber and almost vanilla scent. The heart of this fragrance is in the amber and the florals are used as backing for this. There’s a bit of woodsiness in this too which helps cut up the smoothness with a bit of dry airiness. Applied: Strangely enough the musk is one of the first things I get. Clean and smooth initially as the florals catch up to the party. Jasmine has less of a presence here than ylang-ylang but neither of them are really stars. They seem to be there to bolster this pretty white amber and touch of vanilla scent. Meanwhile the musk is still hanging around giving this an older, more sophisticated, quality while still maintaining the fragrance’s smooth amber floral scent. It’s just hard to describe The Girl. It’s a well-blended fragrance. On the dry down I’m smelling a bit more of the woods as the amber and vanilla chill out a little bit. And I mean, literally chill out. The Girl takes a turn for the cold and ethereal on dry down. Extra: Immortelle, one of the featured notes in The Girl, is used to refer to a number of flowers in which one particular species can be steam distilled for its essential oil. Which smells like rubbery honey to me. Design: The Girl is contained in a 5ml amber glass bottle with a plastic top. It has a limited edition label with the house name fragrance name on it. Notes: White amber, silver birch, immortelle, davana, pale musk, star jasmine, and ylang ylang. I wouldn’t say The Girl is a typical oriental but its focus on the amber and vanilla helps it in that direction. If you’re looking for oriental in the classical sense, you would need to look more into Mitsouko or Shalimar. The Girl is a much more modern smelling oriental that’s in and of the same vein of L’Instant de Guerlain or Allure by Chanel. Reviewed in This Post: The Girl, 2009, 5ml Bottle. This entry was posted in black phoenix, oriental, Reviews By House and tagged alchemy, black, blog, fragrance, lab, perfume, phoenix, review, scent, smell. Bookmark the permalink.